Permaculture draws from several disciplines including organic farming, agroforestry, integrated farming, sustainable development, and applied ecology. Layering is a key tool used to design functional ecosystems that are both sustainable and of direct benefit to man. A mature ecosystem has a huge number of relationships between its component parts: trees, understory, ground cover, soil, fungi, insects, and animals. Because plants grow to different heights, a diverse community of life is able to grow in a relatively small space, as each layer is stacked one on top of another. The Canopy: the tallest trees in the system. Large trees dominate but do not saturate the area, i.e. there exist patches barren of trees. As Stewards of the land we continually experiment with permaculture principles on small land areas of 1/4 to 1 acre. 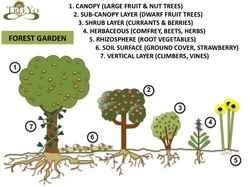 During design and implementation, we focus on sustainable gardens and orchards, food forest management, vermiculture, mushroom production, rainwater catchment, grey-water systems, small animal management, including lamb, chickens, rabbits, fish & bees, natural and green building, hydroponic systems, fermentation, herbal tinctures and plant medicines, diverse composting practices, alternative fuels, passive solar and energy harvesting. We assess the living biology of your soil so that you can make plants and animals grow faster, stronger, and healthier. What is the Soil Food Web? The soil food web is the community of organisms living in the soil. It is the science that describes the complex living system in the soil and how it interacts with the environment. How does it help? Having healthy diverse populations or soil micro/macro organisms builds soil fertility and organic matter. This makes it easier for plants to do well and thrive..
We start with soil sample(s). Your soil samples are reviewed under the microscope to assess the active biology. We will determine the relative numbers and diversity of bacteria, fungi count, protozoa and nematodes. We then create a written qualitative assessment and recommendations to boost the soil biology for greater plant growth and resilience. Give us a call or send an email and tell us how to get in touch. We’ll have a conversation about what we can accomplish together. We can put in a garden, plant an orchard, build a food forest. Just contact us to get started on one of the best investments you will ever make, a project that can produce food for a lifetime.